We’re an HR Tech company focused on providing the cutting-edge technology for strengthening your recruitment process! Since 2009 we work for providing the smartest and easiest Applicant Tracking System (ATS) to Companies and Employment Agencies for supporting them on their most strategic challenge: hire the right people. Our ATS is called In-recruiting, a cloud-based recruitment software. We are passionate about Human Resources and HR technology and everyday our team is committed to ongoing innovation and optimizing user experience and recruitment process. Everything you need to hire, all in one place! 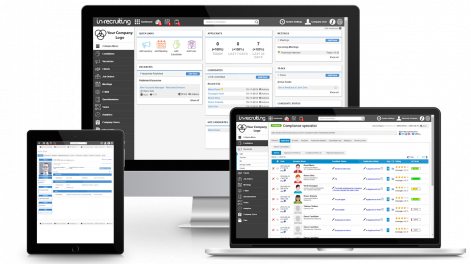 In-recruiting is the next generation Applicant Tracking System (ATS) focused on helping recruiters to find and manage talent, in less time. In-recruiting displays smoothly on any device: desktop, tablet or mobile. You can easily customize your registration form, career page, hiring stages, graphics etc..
We use the most advanced technologies designed to be easy-to use by anyone. Our Recruitment Software is available in 8 languages and it’s completely internationalised to be use in any country. Start using In-recruiting in minutes. We take care of hosting and upgrading the ATS and keeping safe your data. In-recruiting user interface is intuitive and easy to navigate, you’ll love it. Explore what In-recruing is in a short 1-minute video. Do you want to optimize your recruitment process? Let’s start using In-recruiting today. Thanks to our deep experience in recruitment tecnhology and HR, we support our clients in implementing the best Talent Acquisition tools/processes for reaching their hiring goal. We create mobile-ready career site for improving your candidate experience and we integrate it into your ATS. Do you need to develop a tailor made HR software? We support you with the lastest and more performing recruitment technologies. Want to hire the top talents? Our team create the right strategy for increasing your Employer Brand awarness. We know how fast the recruiting solutions evolve and how much it’s important, for HR people, to be trained. Join our recruitment Academy!